Why Hike to Inspiration Point? It offers the El Capitan / Half Dome bookend view of Yosemite Valley that inspires thousands of visitors to stop at the Wawona Tunnel overlook, but it's farther up the mountainside and much less crowded. At least if you don't count trees. 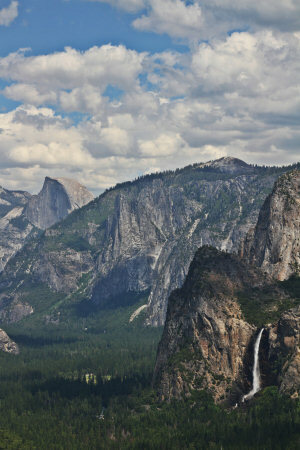 Best Time to Visit: The main purpose of nearly anyone hiking this trail is to photograph Yosemite Valley, so hike it when photographic conditions are best. If you go while there's still some snow on the peaks, it will add some helpful contrast to offset the evergreens and the gray granite. And a few fluffy clouds - or better yet, a clearing storm that's left trails of fog in the valley and clouds casting patterns of light on the valley walls - will be a big plus on the Ansel Adams-o-meter. If you're facing east (and you will be), light is usually best at sunrise or from late afternoon to sunset. Difficulty: It's a short hike, but it's steadily - and during the first half, steeply - uphill. It rates a 4 out of 10. Crowd Factor: Light. But due to all those pesky trees poking up and obscuring the view without any thought to those behind them, there's only one really prime spot for photography, so if there's anyone else on the trail, you'll all be headed for the same patch of rock. Nearest Bathrooms: At Bridalveil Fall, 1.5 miles (2.4 kilometers) down highway 41 (41). Nearest Snacks: Yosemite Village, 7 miles (11 kilometers) ahead. Getting There: The trailhead is at the Wawona Tunnel overlook, photo central for Yosemite visitors. If you're in Yosemite Valley, exit the valley on highway 41, and you'll reach the tunnel overlook 1.5 miles (2.4 km) past Bridalveil Fall. It's just outside the downhill end of Wawona Tunnel. There are parking lots on both sides of the road here; the trailhead is on the uphill side of the road. Hazards: It's only 1.3 miles (2.1 kilometers) to Inspiration Point, but it's all uphill, and fairly steep for the first half of the hike. Given the limited amount of tree-free viewing space at the point, if you find other sightseers there at sunset, you'll have to resort to fisticuffs to ascertain who gets the prime spot. You can establish your alpha-photographer status more efficiently if you bring one of those all-purpose tripods with sword blades tucked away in the legs. Trail Notes: The trailhead looks ominously steep - and in fact, the first half of the hike will make you work. Although the entire route to Inspiration Point is uphill, it grows less steep over the course of the hike. Think of the first half mile as a barrier that will discourage the more timid hikers and give you more solitude on the upper parts of the trail. For most of this hike, the views of Yosemite Valley are checkered with trees. However, there is a spot early in the hike - the parking lot will still be visible - where you get mostly unobstructed valley views. So if all you want is a valley view without the crowds at the tunnel overlook, you might decide just to hike to here and then return. At 0.6 miles (1 km), the halfway point, you'll cross the old stagecoach road to Yosemite Valley. If you take the road in its downhill direction, you can hike to the Bridalveil Fall parking lot two miles (3.2 km) away. Let's assume, though, that you decided to cross the stagecoach road (after looking both ways, of course) and continue to Inspiration Point. You'll pass one more spot where the valley view is mostly clear, but for the most part you'll just be climbing through the trees until you reach Inspiration Point. Inspiration Point itself is a flat granite shelf, about fifty yards (60 meters) long, with views of Yosemite Valley that are - sorry for being so repetitive - almost completely obscured by trees. You'll want to climb down to another granite shelf, about fifteen feet (5 meters) below the main shelf, where you'll find an unobstructed view of the valley tucked between the trees. If there's anyone else around with a camera, follow them, and you're sure to end up there sooner or later. Just to the right of the main viewpoint is another not-quite-so-open viewpoint where your prize-winning photograph will have to be framed by trees. The trail doesn't stop at Inspiration Point. You're actually on the Pohono Trail here, and If you like, you can continue uphill to Old Inspiration Point, where an Army party in pursuit of Indians first sighted Yosemite Valley in 1851; to Stanford, Crocker and Dewey Points; and in fact, all the way to Glacier Point, 11.7 miles (18.7 km) distant, if you're feeling bold and adventurous. You certainly shouldn't be discouraged just because everyone else is on their way back down to the car.